From dream team to pipe dream. It is months now since the brief, alluring certainty of the dwindling Martin O'Neill era dissipated into the ugly expanse of a reality show nightmare. 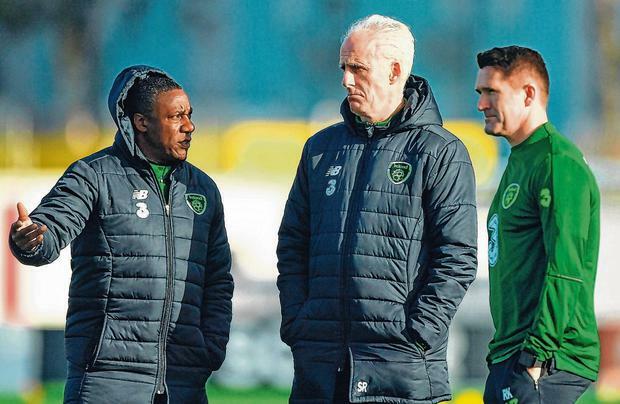 The response of those in charge of Irish football was, predictably, to lean towards more of a nostalgic hunch by drafting Mick McCarthy for his second coming. Reluctantly, and without necessarily clear-headed thinking, adding Stephen Kenny to the staccato process was a clumsy attempt, even if perhaps unwittingly foresighted, to develop a coherent, streamlined succession plan. From the "world-class" Steve Staunton to the genuinely world-class Giovanni Trapattoni, the FAI have spent the past decade or more scrambling through the history books for an inspirational torch to guide their future. The O'Neill era smacked of more of the same; focusing on short-term gains without envisaging the long-term effects. McCarthy's arrival hints at an immediate quick-fix to rectify a stalled vehicle, paid an obscene amount of money for negotiating a passage to a tournament which Ireland, as hosts, can seemingly ill-afford to attend. It's frankly depressing that the FAI should find itself grappling with such uncertainty at a whimsical yearning for past comforts but perhaps it should not be too surprising either. As usual, the means to an end, will define all; as O'Neill tried to justify even when his tenure ran out of meaning. Once the nation can drown itself in six-packs for a few weeks in the summer of 2020, all will be well with the world. McCarthy's arrival was, of course, swathed in incestuous rivalry, as it must when Irish football delves so regularly into its past. That Roy Keane, whose presence, or rather absence, contributed so crucially to the ending of McCarthy's first coming, would find himself succeeded in Irish management by his long-standing nemesis is deliciously ironic. All week in Camp Ireland, the mood music has emphasised the fun, rather than the funereal. 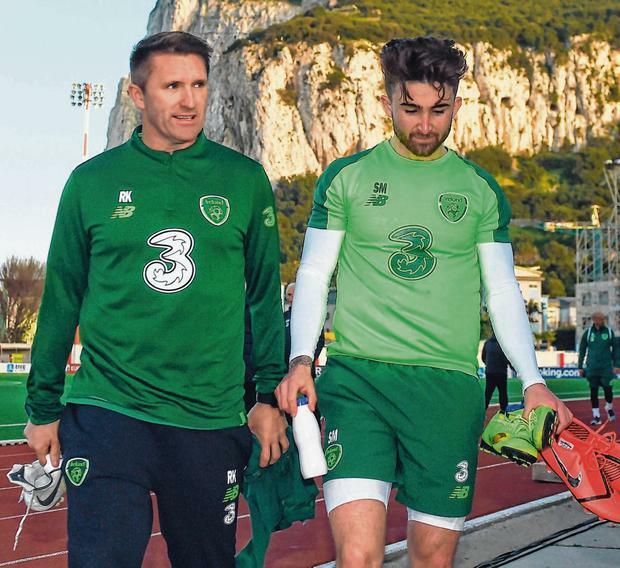 A ream of players, more than usual, were wheeled out to speak with a breeziness that offset the shoulder-sagging weight that accompanied the last few Irish get-togethers. Everyone's life is easier when things are going well. Even when they haven't really started yet. But McCarthy, who has always been a pragmatist, marrying the uncomplicated sincerity of an Irish father and the gruff simplicity of a Yorkshire upbringing, knows this is as good a starting point as any. And so players have conducted warm-ups near the TV cameras and photographers to alleviate their roles, there have been smiles and hugs - all a bit Solskjaer-ish but that seems to have worked, too, for a time at least. We were drawn to a brief announcement during the week which starkly, even if too neatly, marked the new regime's modus operandi as vastly different to the one that preceded it. Sean Maguire, we were told, had sat out training as had been previously agreed with his Preston employers, presumably due to his recent history of chronic hamstring issues. One does not have to be reminded that when Harry Arter was despatched with the same instructions from his employers, the reaction from one of the previous management team was less accommodating. McCarthy prides himself on his redoubtable experiences in the game, winning promotions as a manager and always making play-offs, but carries them more humbly than O'Neill - twice a European Cup winner, as he often reminded us. There is some continuity, though, and it also carries the name of Keane. Robbie's addition to the managerial ticket, on the face of it, is a preposterous notion; with no experience, compared to his namesake's over-estimation of his, McCarthy's revelation before Christmas that the record goalscorer virtually invited himself on to the ticket smacks of one being offered work experience. The crucial difference, however, is that Robbie is not an assistant, as Roy was, but will merely offer assistance. He was not marked down for media duties this week, which was welcome. Roy Keane press conferences, not to mind his acerbic dealings with the squad, became too much of a distraction from his job. Whatever that was. His mute response to his team's tired efforts, and statuesque bench status, reflected one whose inability to coach even minimal improvements from players who were always better with club than country, unmasked his impotence. Robbie, less boastful and impatient, has not been charged with any such responsibility; a squad which scored four goals in 2018, and whose forward line this week contains just one senior goal, can hardly perform any worse. Aside from predictable player endorsements, often starry-eyed, it is too early to discern any manifest innovations that Keane can deploy. The true assistant is 'TC', or Terry Connors, McCarthy's loyal, long-standing advisor whose only challenge to authority will be that freely given to his accepting and respectful boss. Last week, McCarthy spoke in glowing terms of Connor, remarking that when his former long-term assistant, Ian Evans, parted him, he never felt he could be replaced. "But with Terry, I can't see the join," he said last Sunday, expanding on a theme he explored when they were briefly parted between their stints at Wolves and Ipswich. "We have got a really good relationship and friendship. In terms of our business working relationship that is terrific and it's not me making all the decisions and him just agreeing, it's a good partnership that we have. "All I will say is this, he's (Roy) the only assistant manager in the whole of the world who gets this much publicity, nobody else. Terry Connor, my assistant, never got a mention." The contrast with Roy Keane is obvious. And such a presence will allow Robbie to remain in the background; his name on the ticket will be instructive, not destructive. And his ego, such as it is, will not be enlarged to such a degree that he will demonstrate frustration at the inability of inferior players to replicate his teachings. Crucially, unlike his namesake, he will not be deemed a threat either; McCarthy's reign is finite and the succession plan is cast in stone. It will remain a culture shock, though, for a player whose initial forays in India bear no resemblance to the toil required to survive in the game as long as his old, and new, manager has. "What he'll do in the coaching, he'll surely be able to show a fella about positions and where to run," says Brian Kerr. "The point Mick made was interesting, that he's a young lad, he's not that long away from the squad, he would know the younger players. "But he's got to have the enthusiasm for scraping now which he might not have had. "The biggest difference for a player going to be a coach or a manager is the time and commitment and the unending requirements to do things like go to matches, follow up on leads, check out a player. 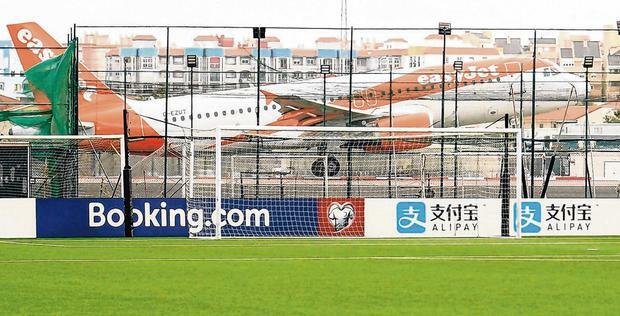 "And it's not always private jets and a pick-up in a limousine and a bloke from the association. It's often about scraping and how do you get from Crewe to Rochdale or Macclesfield. "What he's done in the game entitles him to not to have to go through a long, drawn-out process to see if he's a great coach. "But it's a strange way to get a job, to give a bloke a ring and say, 'give us a job', which is how Mick described it. "I don't know what his role will be, I don't know what Mick has in mind." What may be just as important is what his role will not be; an abrasive, acerbic distraction. 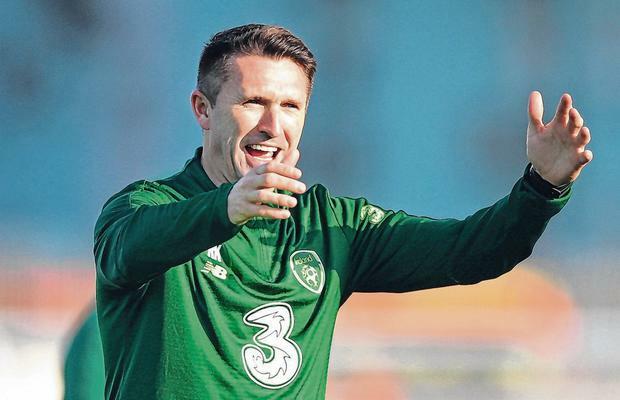 Ireland will hope that this Keane edge will help the current crop of strikers find opponents' net with regularity instead of scoring own goals.